While reassembling rrChild into Phoenix, I fitted it with a NEMA 17 motor from Lin Engineering. These bolt on to the modified X carriage just fine and even fit the old belt gear moulds reasonably well. I wired up an Arduino driver and got it pulling a heavy acrylic extruder mechanism at just under 1A. The shaft is a little short, but things seem to run smoothly. Also, I fitted new diagonal braces (the TSA killed most of the originals), using Ed's idea for a slotted diagonal bracket that needs no trapped nut or bolt. It simply used the M8 nuts to compress the bracket onto the 8mm rod. Works so far. Oh, a Kiwi lasercut RepStrap is taking shape next to it. Hopefully using local suppliers where possible will reduce shipping costs for those in the Oceania region. 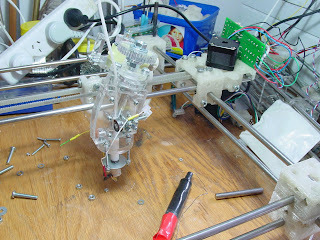 Is the Extruder pictured a Bits from Bytes one or a Ponokofied design? Where did you get the stepper from? direct from Lin or have you found a NZ source that's reasonably priced? It's a Ponokoified one. The SVG files are in users/vik on the RepRap sourceforge SVN repository. The stepper was, I think, sent over from the US by Forrest. I have found a local agent and am working on prices. great news. I'm just starting on the electronics, so I'll be looking for the mech kit soon. I'm in Melbourne, and shipping has been a major hassle so far. The stepper looks remarkably like the sort you used to get in Full Height Floppy 5.25" floppy disk drives (head stepper) circa IBM PC (16/64) vintage.